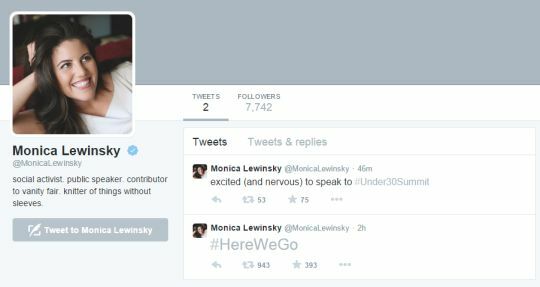 Today, at least for fifteen minutes, Monica Lewinsky is the Queen of Twitter. That’s a joke, of course; Monica Lewinsky is and will forever be known for the less-than-fifteen-minutes she spent destroying an otherwise-lovely blue dress with the help of President Clinton. Monica Lewinsky’s fifteen minutes of fame happened nearly twenty years ago. But today Monica Lewinsky joined Twitter. And over the course of a bit under an hour I watched Ms. Lewinsky’s follower count grow by about a hundred people per minute. You can see that growth here; I took the three snapshots of Monica Lewinsky’s twitter account at 10:05, 10:07, and 10:43 AM. What’s fascinating is that in the first minutes of her Twitter presence, Monica Lewinsky’s Twitter account grew at approximately the rate that Bill Gates’ account grew when he signed up. The one good thing I can say about that is that Twitter’s a lot larger now than it was when Bill Gates’ account was born, so no, there’s no context in which anyone can really say that Monica Lewinsky matters as much as Bill Gates. Thank goodness, because despite being almost as pretty on her Twitter profile as this girl, Monica Lewinsky deserves her fame in a way that isn’t much different from Kim Kardashian. Now: let’s forget Monica Lewinsky and look instead at what matters: Monica Lewinsky Content Marketing. Monica Lewinsky is a content marketer. That may not have occurred to you, and whatever you think about how she got to where she is Ms. Lewinsky is working the content marketing equation from a better place than you are. But we’re all content marketers now and Monica Lewinsky, while not facing quite the same challenges making content marketing work as you might be, is after the same thing you are; whether or not you’ve had or ever get your fifteen minutes of fame you need to get found, and seen. I could go into a full-on rant about how difficult content marketing is, or throw out a hard sell for our services, but there’s a very real, very simple point that you need to Buy. Into. Right. Now. If you aren’t creating content, you’re going to disappear. Getting found by Google on the Internet is the most important thing to your business. This is where Monica Lewinsky has an edge over most people. Early-Twitter-Account-Growth-Rate notwithstanding, “Monica Lewinsky Content Marketing” carries advantages like that little blue check mark. And remarkably, Monica Lewinsky had that check mark in place before she began tweeting! And the little blue check mark is the real point of this story. You can’t have one. At least, not today. You can get “verified user” status on Twitter. Well-executed content marketing can get you to all kinds of places that you might not have thought about, and while verified user status is the kind of thing that applies in the same way as creditworthiness (“if I had money I wouldn’t need credit …”), there’s a very simple truth here: the longer you wait to embrace content marketing the more difficult it becomes to gain Lewinsky-esque stature. I hope you’re laughing right about now; you want to do Monica Lewinsky Content Marketing, but I’m pretty sure you don’t want to do … umm … well, you know. Besides, you probably don’t have the right dress for the job. Click around. Say hi if you like. And if you want that blue check mark, you can always get down on your knees; it turns out Twitter likes that. Jeff: Who is Monica Lewinsky? 😉 Do you think she will send a DM to Bill Clinton, with a blue print of new content marketing ideas? Better question, Martin: do you think Bill and Monica are even following each other so she CAN? I don’t think so! 😉 Maybe Bill Clinton will “poke” her on Facebook? Listen, this stuff is silly, right? If you can’t throw some humor into such earth-shaking topics as Monica Lewinsky on Twitter, it gets pretty dull, pretty quick! Yes, the whole drama about Monica Lewinsky’s admin. team, entering a new social media channel, is pretty silly. A bigger news item is that #TheQueenTweets. >> Today, at least for fifteen minutes, Monica Lewinsky is the Queen of Twitter.